Here is an easy recipe for crepes. Crepes are nice to have handy if you’re craving something sweet and/or savory. Sometimes I will just spread some jelly on it or do a German-style crepe, which is just lemon juice and powdered sugar, hold the butter(German-style crepes are my fav btw) or cheese with deli meat for a savory crepe. Crepes have the flavor of a pancake but thin and light, and you don’t feel like you need to go into hibernation mode after you eat them : )! I use a blender for this. You can use a mixing bowl with a handmixer, too. 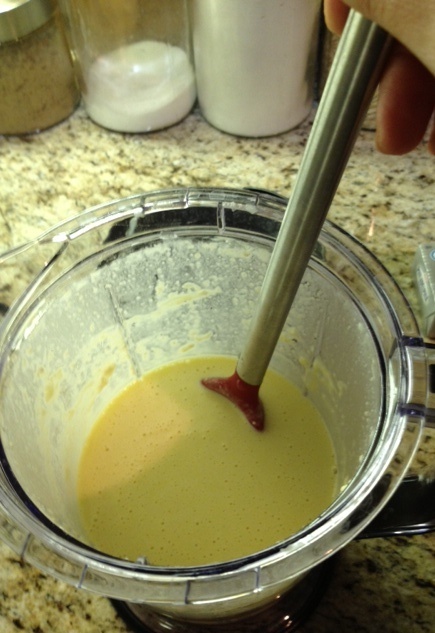 I like using the blender because I can mix everything with just the push of a button and you can pour the crepe batter right out of the blender jar into the hot pan. First step, dump all of the ingredients into the blender jar. Place lid on top and blend until there are no chunks of flour left. 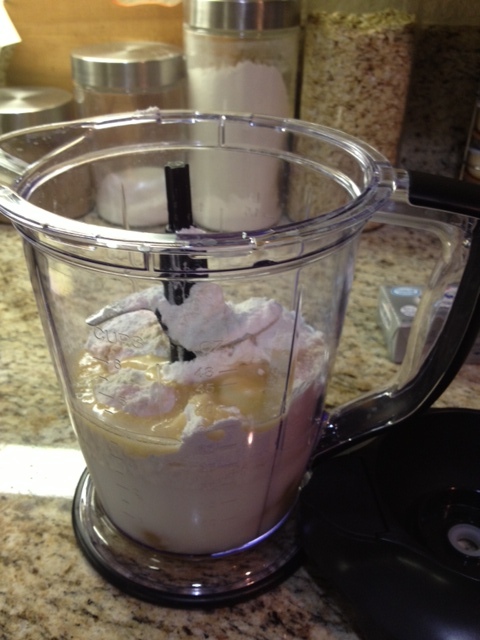 Halfway through blending, stop the blender, and with the spatula scrape the sides of the blender jar to get the excess flour off and mix the contents well. Sometimes the flour tends to stick to the bottom. 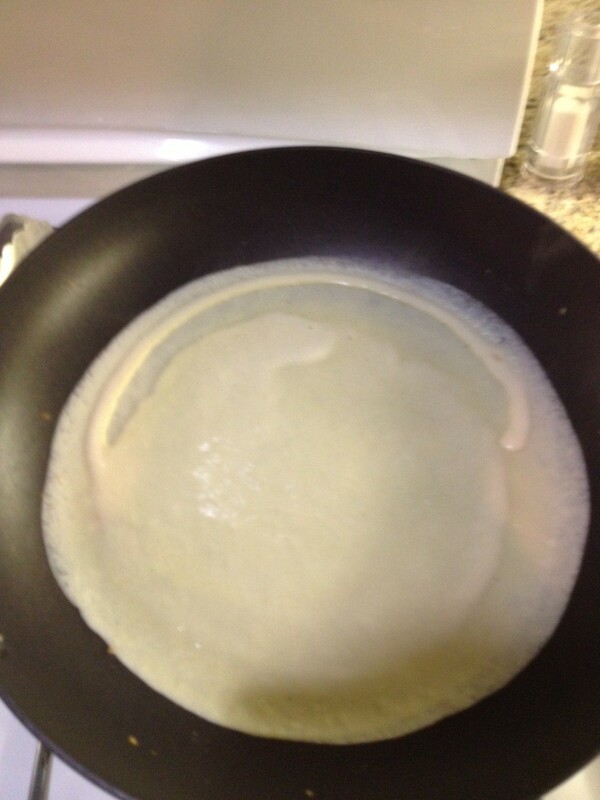 Once the crepe batter is done, take the nonstick pan and place it on the stove. Set the burner knob right between high and medium. After about a minute on the heat, pour in your first crepe. The amount I pour is I eyeball a little over the size of a baseball. After pouring, tilt your pan to coat the whole base. The batter will move easily around the pan. Cook as many crepes as you want to serve. Sometimes I’ll just cook the whole batch or I will keep the batter in the fridge and use it the next day, just give it a quick whisk. I would not use the batter past its second day in the fridge. 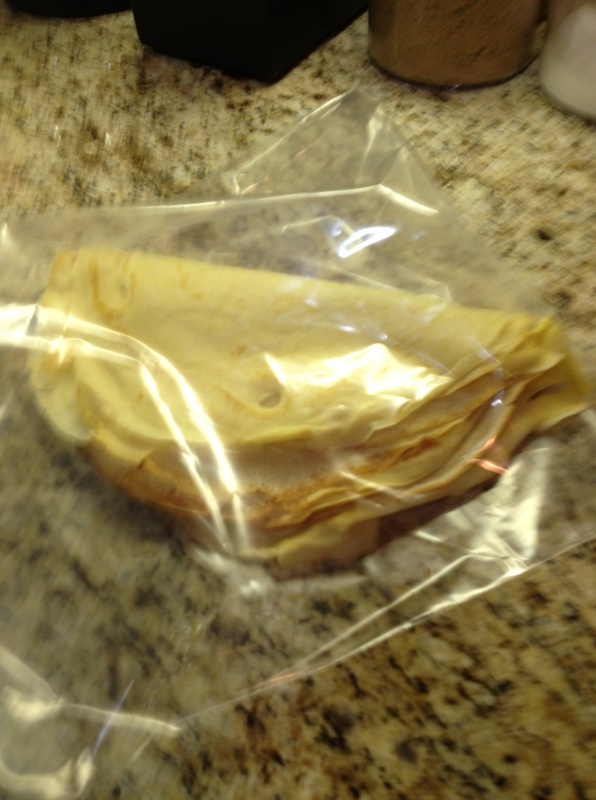 If you cook the whole batch, you can fold the crepes in half and put them in a ziplock bag and store it in the fridge. For the crepe filling I use a sugarfree seedless blackberry jelly. Take one crepe and spread the jelly on half of the crepe. Fold the crepe in half then fold again to make a triangle. 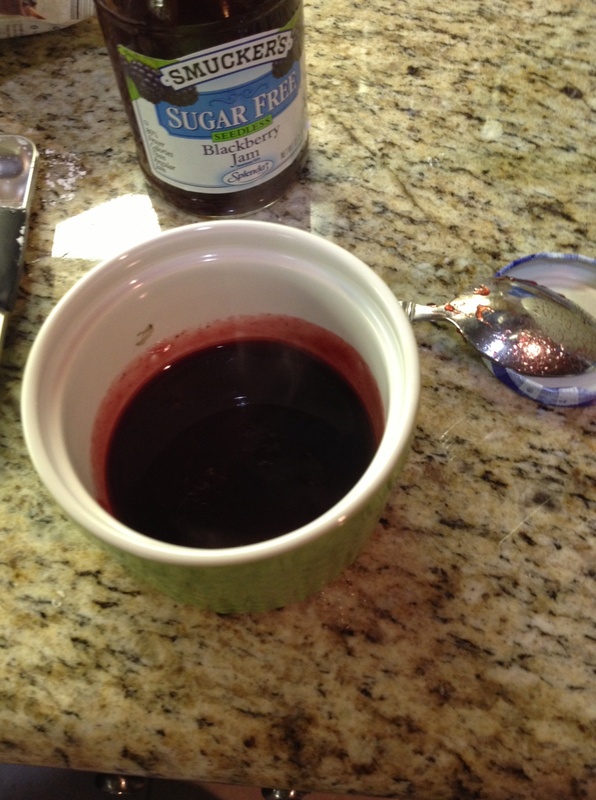 In a small dish, scoop a large spoonful of jelly and microwave for 20 seconds. This will be your drizzle topping. 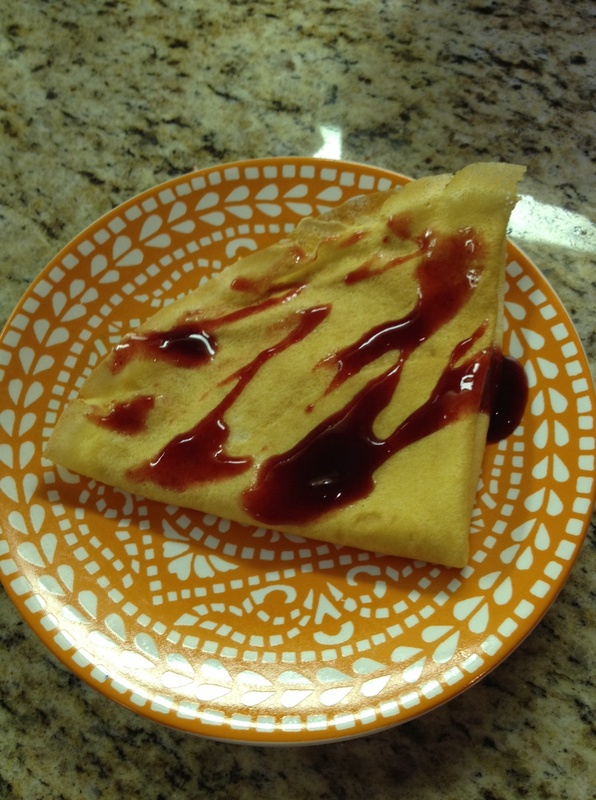 This entry was posted in Crepes, Home, Recipes and tagged breakfast, Crepes, egg, Food, jelly, Recipe by mrewilson. Bookmark the permalink. Delicious! This is another one I’ll have to give a try! Your blog has been quite a find 🙂 YAY! Wonderful! I am so glad this blog has been a find for you! Thanks for all your kind comments :)! Those look really good, and I guess you could use your favorite kind of jelly? What if one does not have a blender. Can you whisk the ingredients? Yes, a whisk will work just as well. Yesterday, I reheated a leftover crepe in the microwave for 20 seconds, took a little powdered sugar and lime juice drizzle on top, mmmmmhhhh!! So good! Yummmmmmy to my tummy! 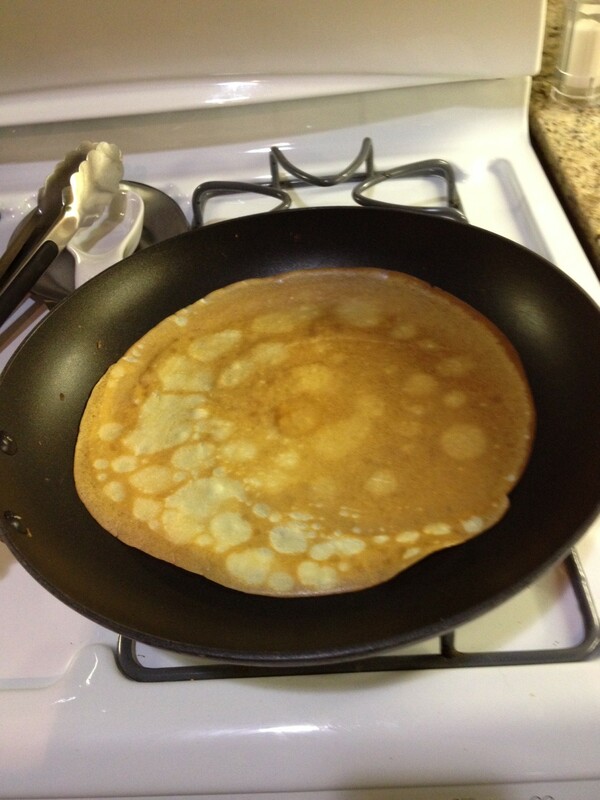 I LOVE crepes (I think I told you this on Friday lol). Any tips on flipping? That’s the part I can never get down! I’m sure it has a lot to do with having a great non-stick pan which I don’t lol. Yes, invest in a nonstick pan, so helpful in the crepe process! You don’t even need to use a cooking spray or butter in the pan. The butter in the crepe batter also helps to prevent the crepe from sticking. When I see the edge of the crepe browning, I will gently pull all around the edges with tongs or sometimes my fingers to loosen it, and then the crepe just lifts right off. I love crepes. I want to try and learn how to make them so this is perfect. Thank you for the recipe.